Physically measures approximately 48” so should be OK for around a 44” chest. This example has a typical late war multiple panelled front and back. The leather is in very good overall condition retaining most of the original chromed finish and very good flexibility. There are no tears/repairs or notable damage and in general, only relatively minor surface wear and crazing. Most wear can be seen on both 'elbow' sleeve panels (see photograph 10). The finish could no doubt be improved with the application of a light leather dressing but we will leave the buyer to make that decision. All zips are original. The main zip manufactured by Lighting, both sleeve zips are Air MInistry marked and complete with leather pull tabs. 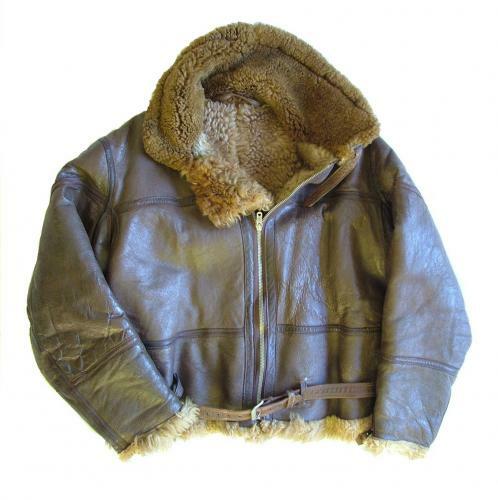 Excellent mid-length light brown fur lining with a shorter pile mid brown collar. The fur trim remains good at the waist and quite good on the left wrist but is worn at the rear of the right wrist. The jacket has the original belt, sewn leather hanger and collar strap/rings. Indistinct markings in white paint (?) to upper rear panel. A very good to excellent later war example in a good size. Stock code J20792.